Choosing the right metal for an engagement ring is a crucial part of the ring-design process. Once you know a bit about the basics of ring metals, deciding on a metal is a rewarding and simple process. 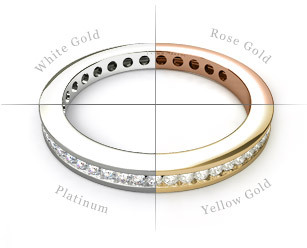 Choosing between white gold, yellow gold, or platinum is as much as matter of personal preference as it is of budget. Before you make a final decision, it is worth weighing the pros and cons of the various types of engagement ring metals. White gold is an incredibly beautiful and popular choice for engagement ring settings, which is quickly becoming the number one choice in engagement ring metals. James Allen offers white gold in 14K and 18K. 14K gold contains 58.5% gold, while 18K white gold is made up of 75% gold and 25% other metals (nickel, zinc, etc). White gold has the overall look of platinum, but is notably less expensive. White gold beautifully compliments diamonds that are rated D-I on the diamond color scale, as it enhances the brilliance and sparkle of the stone. White gold is typically alloyed with nickel, zinc, silver, and/or palladium to give it its white color and is often plated with rhodium—a shiny, white metal that is a member of the platinum family—to give it an even whiter appearance and protect it from color loss. Although white gold is not subject to tarnish, it may develop a slightly yellow color over time as a result of its 75% yellow gold content. If this happens, white gold’s original beauty can be restored by a simple re-plating. Even though white gold is resilient, there are important measures you can take to keep you jewelry looking as good as new. To keep white gold shiny and scratch-free, store it in a soft cloth bag or fabric-lined jewelry box. White gold should be cleaned with mild soap and warm water, using a non-metallic, soft brush (like a toothbrush). To retain white gold’s luster, make sure to keep it away from harmful and corrosive chemicals such as bleach, ammonia and chlorine. And always use a soft, lint-free cloth—never paper towels—to dry the jewelry. Yellow gold is the most common of the golds, partly because gold is yellow in its naturally occurring state. The yellow gold used in fine jewelry is typically alloyed with silver and copper; its color depends on the amount of pure gold in the alloy. The advantages of gold are that is does not corrode, tarnish or rust, so it can be counted on to provide lasting beauty. And even though it is strong, gold is more "flexible" than the other precious metals. Pure gold, graded 24 karats, is too soft for use in making jewelry—as a rule, the higher the karat count, the softer the gold. 18kt gold is composed of 75% gold alloyed with 25% other metals, and is used in the making of fine jewelry. 14kt gold, which is composed of 58.3% gold, is commonly used in jewelry in which strength and hardness are important factors. 10kt gold is made up of 41.7% gold, and 10 karats is the minimum amount of karats an items needs to be classified as real gold in the U.S. Authentic gold jewelry bears a "karat mark", which is a "k" stamp. According to U.S. law, every gold item must also be stamped with the manufacturer's trademark and country of origin to ensure the authenticity of the gold. Even though gold is resilient, there are important measures you can take to keep you jewelry looking as good as new. To keep gold shiny and scratch-free, store it in a soft cloth bag or fabric-lined jewelry box. Gold should be cleaned with mild soap and warm water, using a non-metallic, soft brush (like a toothbrush). To retain gold’s luster, make sure to keep it away from harmful and corrosive chemicals such as bleach, ammonia and chlorine. And always use a soft, lint-free cloth—never paper towels—to dry the jewelry. Platinum is a rare and valuable metal that is only found in limited quantities in a few, select regions of the world. The annual worldwide production of platinum is approximately 160 tons, compared to 1,500 tons of gold. This is why platinum is more expensive than the other precious metals. Platinum has grown increasingly popular in recent years due to its beauty and durability. Platinum’s rich, even color and sheen makes it a popular choice for engagement ring settings, as these qualities magnify the sparkle and brilliance of diamonds that are set in the metal. An added bonus of platinum’s 90-95% purity grade is that it rarely causes any allergic reaction, and is therefore the ideal metal choice for people with metal or contact allergies. Platinum is strong and can withstand a lot of stress, more so than other precious metals. It is also a naturally white metal that naturally retains its brilliant white luster naturally— white gold, on the other hand, which is mixed with alloys to give it its white appearance, loses its white shade and begins to yellow over time; white gold jewelry needs to be re-plated during its lifetime in order to maintain its white color, whereas platinum naturally retains its color. Most fine platinum jewelry uses 95% platinum, with 5% alloys. The closely-related iridium, palladium, and ruthenium are alloys that lend additional strength to platinum. In the United States, every piece of platinum jewelry sold must carry a purity stamp. "950 Plat" indicates 95% purity and "900 Plat" indicates 90% purity. In the U.S., anything less than 90% pure platinum cannot be sold as "platinum" jewelry. Maintaining the appearance of platinum is as simple as soaking the jewelry in a mild solution of soap and warm water and gently scrubbing with a soft-bristled brush. To keep platinum shiny and scratch-free, store the jewelry in its original box, a soft cloth bag, or a fabric-lined jewelry box. If platinum is worn daily, it may develop a slight sheen. Although most people prefer this look, you can always have jeweler polish platinum jewelry restore it to its original shine. Rose gold is a gold and copper alloy commonly used for specialized jewelry and coveted for its warm, reddish color. Rose gold is also known as red gold and pink gold, and sometimes as Russian gold, as a result of its popularity in Russia in the early 19th century. The difference between red, rose and pink gold is their copper content. The higher the amount of copper in gold, the more pronounced the red color. Pure gold is a deep yellow color and pure copper is reddish. The color of rose gold is somewhere on the spectrum between the two, depending on its individual composition. A common alloy for Rose gold is composed of 75% gold and 25% copper by mass. Even though gold is resilient, there are important measures you can take to keep you jewelry looking as good as new. To keep rose gold shiny and scratch-free, store it in a soft cloth bag or fabric-lined jewelry box. Rose gold should be cleaned with mild soap and warm water, using a non-metallic, soft brush (like a toothbrush). To retain rose gold’s luster, make sure to keep it away from harmful and corrosive chemicals such as bleach, ammonia and chlorine. And always use a soft, lint-free cloth—never paper towels—to dry the jewelry.